Home > Beaded Curtains & Columns > Wood Bead Curtains > COMING SOON! Plain Bamboo Beaded Curtain 90 Strands 35" x 75-78"
COMING SOON! 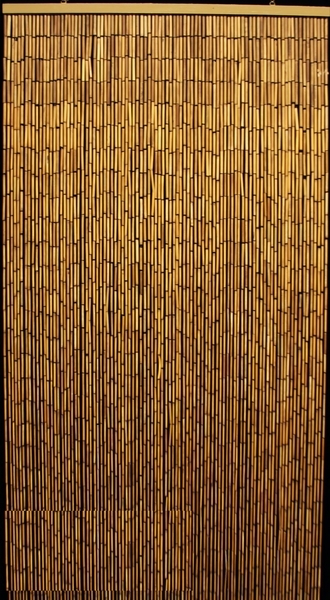 Plain Bamboo Beaded Curtain 90 Strands 35" x 75-78"
These are the same bamboo beaded door curtains we supplied to the production set of the movie Australia, starring Hugh Jackman and Nicole Kidman. Our handsome plain bamboo bead curtains at ShopWildThings also were used in the hit movie Meet the Fockers and popular HBO series Big Love. Leading event planners and individual customers also love these all-natural bamboo curtains for providing so much coverage as a doorway entrance, room separator or backdrop. 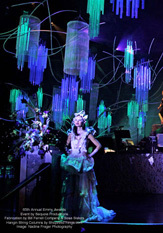 Each curtain is 35 inches wide and 75 to 78 inches in length with a space-filling 90 strands per rod. Watch our video on this page to learn how easy it is to hang our beaded curtains. These versatile bamboo strand curtains can be used to line a wall, create a lovely window curtain or separate spaces at outdoor events. One preschool teacher purchased them to add more natural elements to her classroom. Tie to the side, or let them hang straight down. 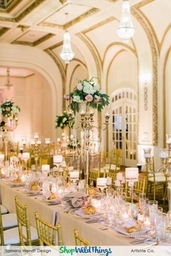 Our photographs and five-star customer reviews on this page offer more great ideas. Great quality, and even better customer service! In this day and age, with automated everything, I was so pleased to experience customer service beyond my expectations. When they didn't have the exact item I ordered, they were quick to let me know, and to recommend an alternative. I ordered the alternative, and am VERY happy with it. Well packaged, shipped quickly, and wonderful quality. I will be a repeat customer, and I highly recommend them to all! Merchant Response:Thank you so much for this glowing review of your product and most importantly, of your experience with us. We love that you took the time to do this. We've shared it with our whole staff! Was a perfect solution to my problem. Customer service both helped me with my selection followed through on everything. Merchant Response:Thank you so much for taking the time to post a review and for your kind words. We really do care about our wonderful customers and do our best to provide you with top quality customer service. We are thrilled that your curtain worked out so well for you. These bamboo curtains are just wonderful! They make the gentle sound of rain as they move. So soothing! 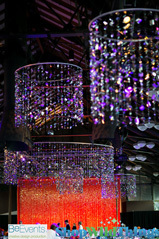 Beaded curtains like chimes, instantly shift & clear energies, just love that aspect too! I hung 3 Pearl & acrylic bead strands (from this site!!) 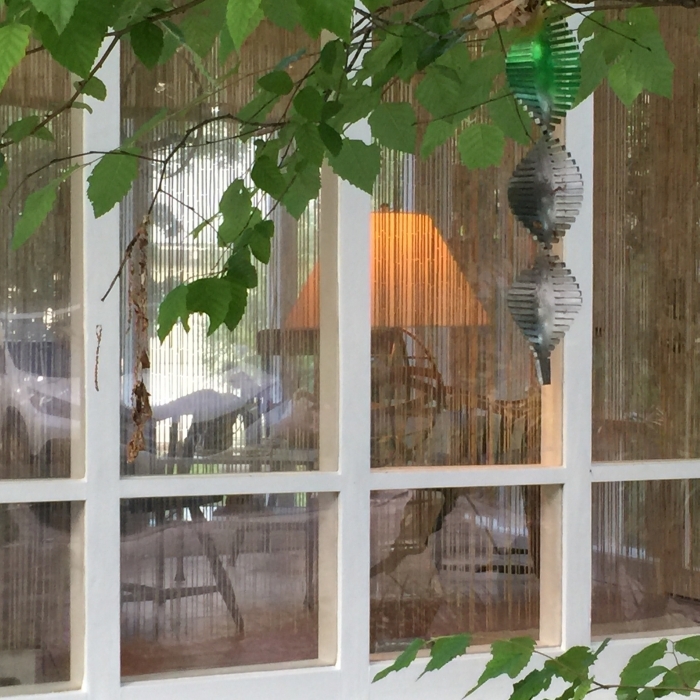 over the bamboo curtain...love the look, the sound, the privacy & the energies of it all!! Thank you for offering such quality & fun items!!! I have ordered 4 curtains from this company and very pleased with customer service. They even went to the warehouse to confirm that I could saw the top of the curtain to make it seamless. These are absolutely perfect for my lanai where dogs go in and out several times a day and since it is done with wire there is much more longevity for continual use. I'm very pleased !! Well worth the money. Pros2 of these cover an open sliding glass door perfectly and gives the room a tropical feel. Arrived in good time. They match. Just what I ordered. ProsI like that I didn't have to assemble anything and they weren't tangled. ConsI wish they were a bit thicker- more starnds. 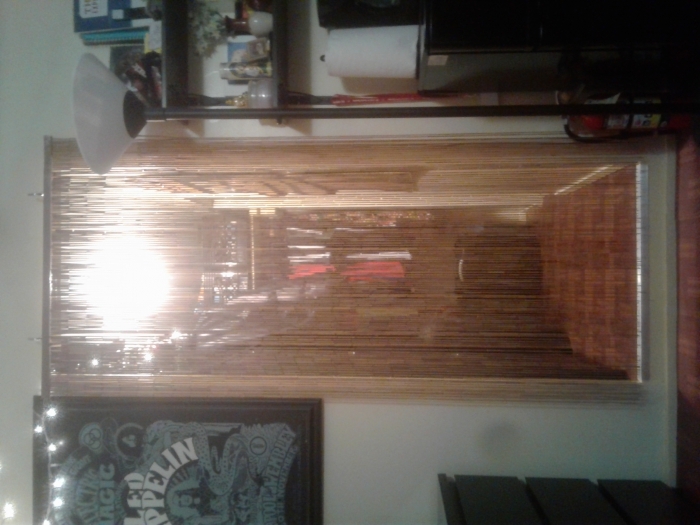 Bamboo curtain perfect for tiki bar! Very well made and easy to hang! I've had many beaded curtains but this by far is the best! The sound when you walk through is addicting, besides it sounding amazing it looks great no gaps or breaks and complements my room very well. Easy to install and adds accent to your home. Excellent Choice! This is the second or third time I have ordered theses hanging door bamboo beads. I love them for the added privacy for our pool deck sliding glass doors. They let in enough light but not peeping eyes. Easy to install and lovely to look at. Thank you for keeping the product as good as the original beads I purchased over a decade ago. 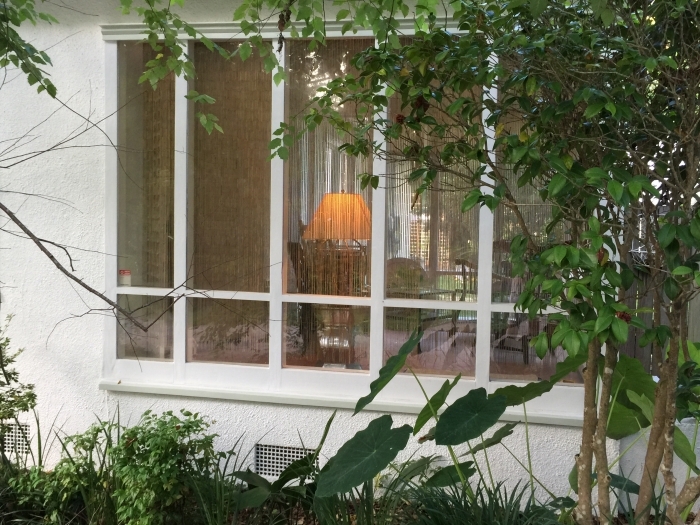 ConsBead length is not consistent so a few adjustments on your window placement might be required. Perfect. Hung these between kitchen and laundry room and they look better than I had hoped. Good quality doesn't look cheap. Wonderful accent to my room. This is my second one since I gave the other to my neighbor's daughter because she liked it so much! Love our new bamboo curtain! Using it as a closet door in a place where there was not room for a door to open in or out. 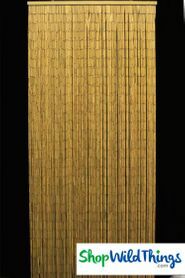 It hangs beautifully and love how it moves slightly in response to movement in the room reminding one of living bamboo. Love the product! Amazing job done with care! I am extremely pleased and recommend this site to others! Thanks, guys! I'm totally satisfied with the item I purchased. The item came well packaged and arrived in a timely fashion. Keep up the good work! exactly what i ordered. timely processed & shipped. properly packaged. this company is the "go to" source for door beads. 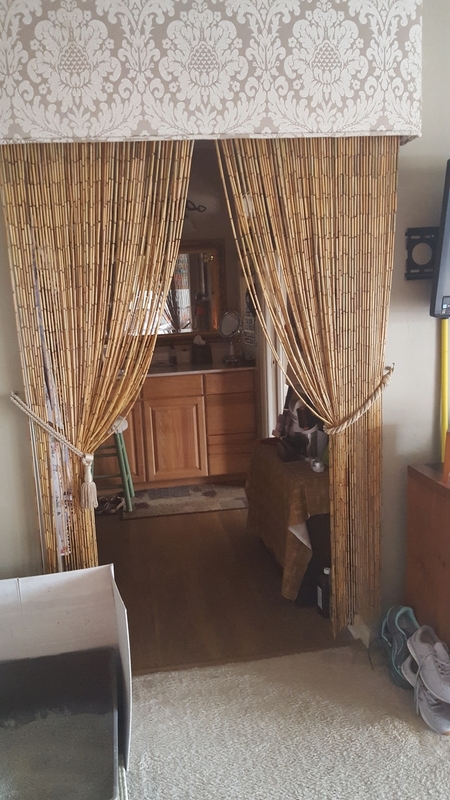 since this set of door curtains is covering a pantry area, i decided i wanted a double thick effect and so i have ordered an additional set to really shield the contents from view. this is my 4th or 5th purchase form this company and i highly recommend them. Merchant Response:Thank you so much for your continued business and for taking the time to share your comments with us!! We really appreciate you! Love it! Looks really great hanging in the Entrance to my Washroom. The color matches perfectly with my decor. ProsGood Conversational piece knowing this was the same curtain used in the movie Australia with Nicole Kidman and Hugh Jackman. Also, the hit movie Meet the Fockers. Exactly as described. No surprises. Packaged beautifully. I gave it 4 stars because it really isn't what I wanted. I do love the sound they make when walking through them. I want something heavier with thicker beads. ProsExactly as described. Packed well. Will buy from them again! I was searching for something to hide a rolling rack full of clothes - but still wanted to access them with ease. This solution is working quite well. I like the look and am going to add a decorative hook and cording that lets me tie them up when I'm searching through my options or packing for a trip. 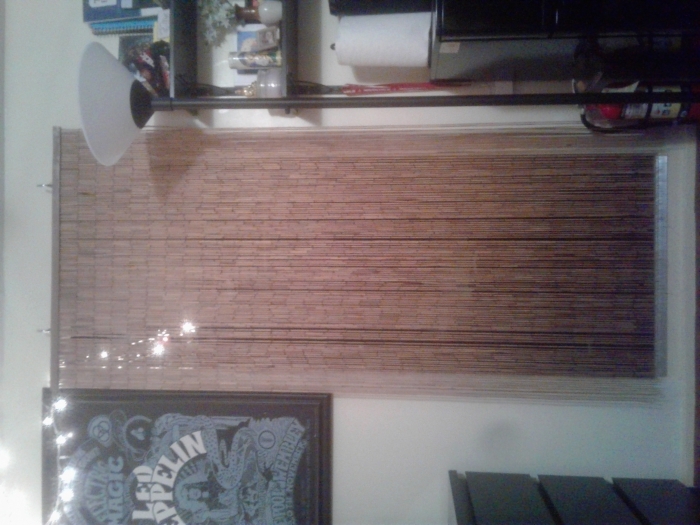 Service was incredibly fast and professional, definitely recommend shopping "here"
This is my first bamboo curtain and I'm satisfied, it was worth it. ProsAdds a zen feel, looks great, easy to install & you'll get plenty of compliments. ConsThe wires that hold the bamboo bend easy, the bamboo breaks easy, not good for privacy, top part that holds it together has a mediocre paint job, and it's loud. I have beachfront condo and had a continual problem of closet doors off the track. I finally replaced the bifold doors with the Bamboo Curtain! It looks fabulous and no more handyman calls! Fast delivery. Perfect for hiding open pantry. Easy to install, looks better than expected and just plain fun. Excellent Product - Very Happy to have this Curtain in our Home! 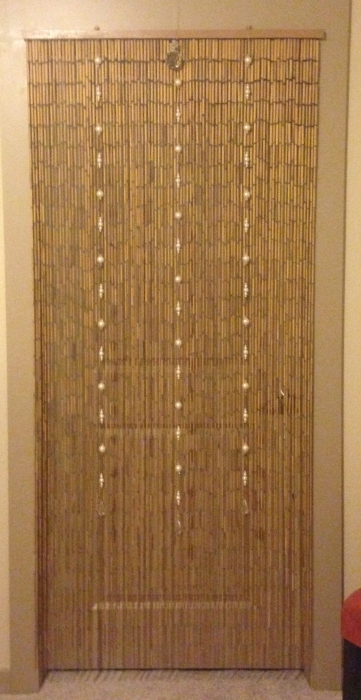 After doing quite a bit of searching for the right item, this bamboo bead door makes us happy about our choice every time we look at it in our home! It's great quality, looks and feels and yes: also sound very nice - we wanted to let you know that we couldn't be more pleased with prompt description and service. Keep up the good work! And cheers to doing business with you. Merchant Response:Awesome!! Thank you so much for shopping with us. We are so happy that you love your new curtain. ProsThe details about having this item on the film set of "Australia" with Nichole Kidman and Hugh Jackman was a nice touch to the description. Also makes a good story when we tell our friends where we got our bead door from! Got here quick and was very easy to hang. I had a 24" door way to sort of junk closet without a door in a guest bathroom. Just hung it inside the closet and if the closet light is not on completely conceals what is in there. It does not at all look like a 70's throwback. 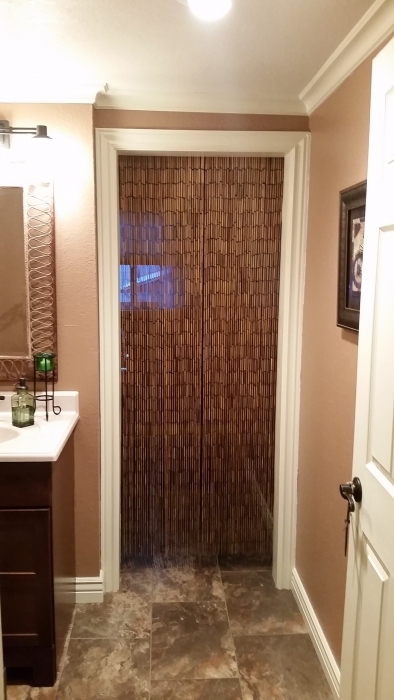 Using the bamboo beaded curtains in place of doors in small house and they work perfectly. Provide some privacy and easy walk-through. It took me some time to locate a door curtain that suited my needs. When it arrived I found it is a better quality than I expected, well made, great color. Really happy with the purchase. 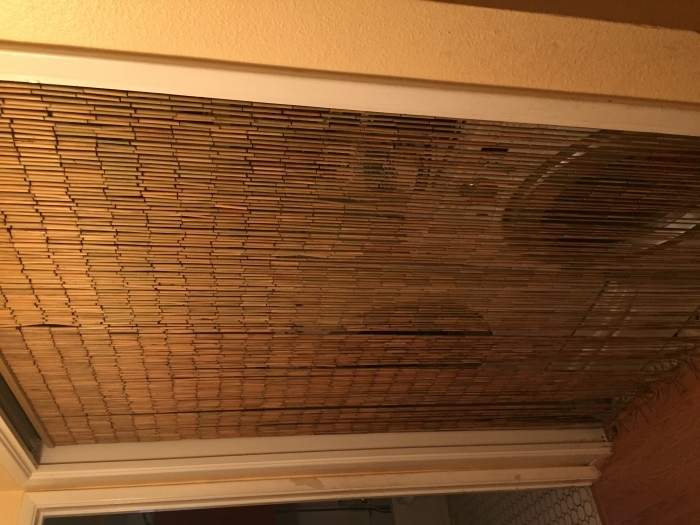 Solid beaded curtain to hang in any doorway. 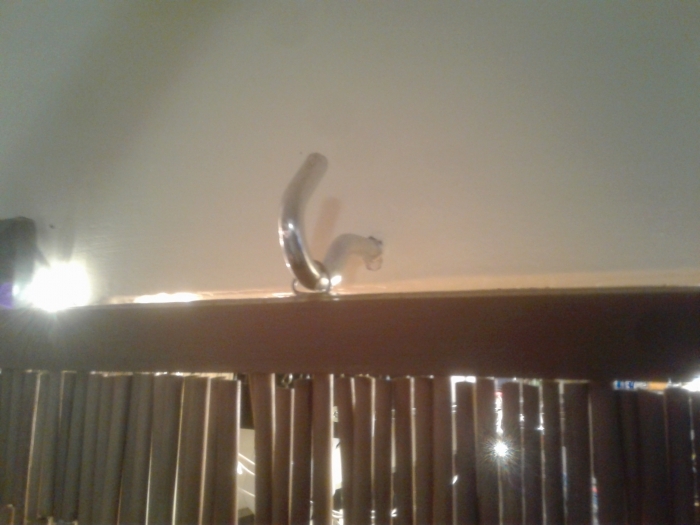 Has 2 hooks on top of it that can get hung on nails in doorway. Somewhat transparent but provides enough privacy and nice sounds in a breeze. I love these! They were easy to hang up and look great on our screen house by the pool! This product is exactly what i wanted. We hang it outside and it blows gently in the wind with a beautiful soothing sound while we sip our beers and enjoy the awesome nature. It also provides a bit of privacy - Thank You! 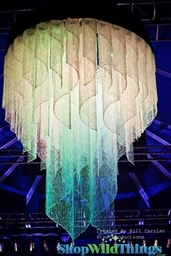 Light, graceful bamboo curtain. Let's light through. Definately not for one seeking privacy. Fits my needs perfectly. Lovely bamboo curtain that arrived in just a few days. We ordered 4 of these a couple of years ago after much searching extensively. They finally needed to be replaced so more were ordered this year. They add so much ambiance to our deck & gazebo in the summer. They don't block light but give a nice filtered privacy. ConsWires on end of strands do tend to get tangled & break in the wind but we will continue to purchase new ones as needed. Exactly as described! Easy to hang. Looks great! We absolutely love these curtains. Put them up between our laundry room and bath. They were too long and wide for the opening, as I thought they would be, so we put them on top of the door jam on the laundry side and they look great! Merchant Response:Thank you so much for taking the time to post a review and photo. We value your input and really enjoy seeing your vision come together. They look great! Product arrived quickly and hanging was simple. Serving it's purpose well to conceal an old closet with no door. I'm reminded of the 60's with this. It is just what I needed to cover an open pantry. It's dense enough that from a distance you can't see through it, but when I need to get something I can see what I need. Great product! Fast shipping! I put this curtain up in about 2 minutes. Seems to be well made. I am so glad there wasnt any odor to the curtain at all when I opened the package. Sometimes imported items can have a chemical type odor to them -- not this one! Very happy with the purchase and feel it is worth the price. 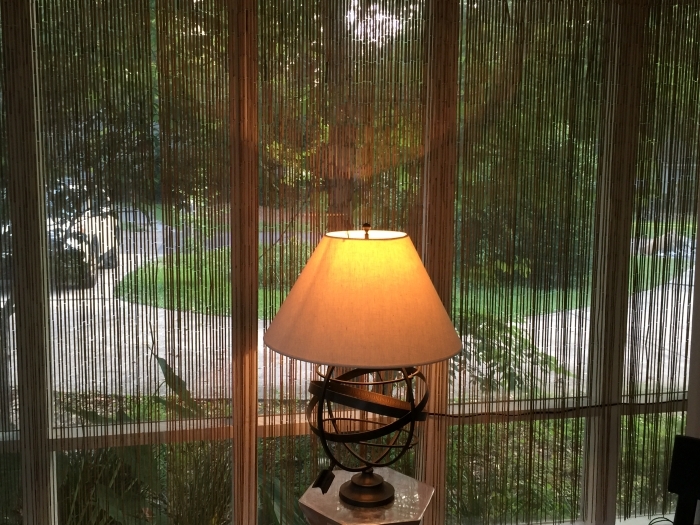 Ordered a Plain Bamboo beaded curtain, 90 strands, 35" x 78"
Arrived timely & in excellent shape. We didn't hang it for 2 months because we had to first paint the library. Now that it is in place - it totally makes the room. Now to kep the Arrived timely & packaged well. Didn't unpack it for 2 months as we had to first paint the library. It hangs so nicely. Now to keep the little grandkids away from it. ProsCame in exactly the size requested. Thank you! In our household we actually call them Greg Brady beads! These are great; they seem well made and can be effortlessly intalled using hanging hooks (sold separately) and a hardware-free adjustable length shower curtain rod. We have purchased this item twice and are very happy with it. The 90 strands (instead of 60) give better coverage against bugs. We wanted something very simple and this fits the bill. ProsBeads are strung with wire and are sturdy. We have another curtain strung with string and beads are always breaking off. ConsThe beads are smaller towards the bottom, which provides slightly less coverage. Works on the closet in our entry! We have a shallow 'closet' facing our entry door that has hooks for coats and low shelves for shoes, and it holds dog leashes, jackets and umbrellas. It can look messy but there's no room for a door, and a curtain would get in the way of using it. This bamboo curtain looks great there and hides the space very nicely but you can still reach through it wherever you need to. Thanks! We were very happy with the product! I appreciated the ease of ordering, the updates about shipment and the personal note with my statement. Return policy was explained very well, not that I need it. ProsEasy to assemble. Gives my daughters a tropical look to their Hawaiian themed bedroom. The beads hide enough of the contents of the closet and make it easy to enter. Or double doors kept getting unhinged. The bamboo curtains were promptly sent. I received them in perfect condition. Installation was VERY easy. I had to cut the wood rod because they were too wide (which I already knew when I purchased them) and no strands were lost while I did this. The quality of the curtains is very nice and they hang evenly. I did buy the hooks that are offered to hang the curtains and did not have to use them for my type of installation. I'm keeping them because, as a DIY person, I'll find a use for them. All in all very pleased with the curtains. As a repeat customer of ShopWildThings, I had every confidence I'd get a good product. I was not disappointed. I ordered three of these to replace a rather battered roll-up bamboo shade on the west side of our sunporch which faces the street on a suburban street. I got my step ladder, hammer, some 2 inch long nails, and opened the boxes. Each curtain had two eyelets evenly located about 8 inches from each end. I hung the first one on the trim above the 10 foot wide wall of Lexan window panels. Then by holding the next curtain up, I allowed each metal eyelet to mark its location on the painted surface. The other two went up lightning fast. You can tell installation is a breeze. The bamboo sections on this beaded curtain graduate from medium size at the top to small at the bottom. You can see through the curtain from inside the room, and if you are intent upon it, you can see into the room from outside as well. Our sun porch is beside the driveway and has this wall with the 3 beaded curtains facing the street. It is our "window to the world" and we are not seeking total privacy in this spot. If that had been the case, I'd have chosen a different style of window covering. ProsNatural look. Fluid delicate movement of the curtain, with a soft sound when parted. It can be held back with curtain hardware but not "drawn" aside. Would look good on a wall, as well as over a semi-private window location. It takes the edge off of sunlight entering through a window without blocking the view. 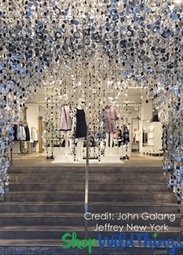 It lends a romantic look, plus it makes the space inside feel "enclosed." ConsNot for a person seeking privacy. Might not be good where rough use is anticipated. Not for a child's room, since the bamboo pieces are small, may represent a choking hazard, or the same considerations as for venetian blinds cord safety. AWESOME PRODUCT! HOUSE LOOKS LEGIT NAO!! CAPS TOTES NECESSARY!!! I am so very pleased with my order. I have always wanted a bamboo beaded curtain. It's the perfect accessory for my bedroom. ProsIt gives a little privacy with lot of style. ConsI just wish the length was bit longer. I bought two of these & mounted them side by side to close off a den area. I was very pleased with the arrival of the product (from ARIZONA)(and previously from ??) I had looked for these hanging bamboo curtains for a long time & could never find them. I thought these were to be a solid curtain...misread the ad. Well worth the money, sturdy so far and I have two cats, and very reminiscent of the 60's! My guests all comment on how well these look. Merchant Response:Thank you so much for your business and for your review! We appreciate you! ProsExactly what I wanted - installation is simple; two nails or two screws is all that is required. ConsThere are no CONS so far. I received the curtain quickly. This picture makes the curtain look more solid with thicker strands. Disappointed in how easily you can see through the doorway. Delivered very timely and damage free. What I expected. Merchant Response:Thank you so much and we're tickled that you're so happy with your curtain! We have awesome customers! One of the boxes was a little damaged when I received it. This resulted in a couple of broken beads on the bottom, no big deal. There was no sence contacting the store over that. Poop happens. The other panel was in perfect condition and both are installed and looking great. This curtain is my fourth in the last two years. The first two were made of short, painted tubes (bamboo, possibly, or cardboard), connected by flimsy iron wires. They fell apart in a few months. The third consisted of plastic beads and discs, on knotted strings. They were constantly getting tangled and breaking. It lasted perhaps a month. This last curtain is much better construction, providing a more opaque doorway. It doesn't tangle and so far seems to be holding up well to daily traffic. I live alone, so there's no issue with kids or pets. It looks even better than the photo. It's a touch of the seventies. Love it! The curtain was the perfect answer for hiding a room off the kitchen where a door had been removed. It is easy to pass through. I was worried about the cat getting through it, but she never even batted an eye and marched right through. It added just the touch I was looking for. It is not for someone who is looking for a privacy curtain as it is see through with light behind it. ProsEasy to install. Service was excellent from ordering to the prompt delivery. Well worth the $$$. Lightspeed Shipping. Very easy to install. Very Happy!! I was pleased as I specifically requested the 78" length and that's what I got. These are great- purchased them for my preschool classroom because we're encouraged to have more natural elements in our room. Wish I had ordered more. Many parents have commented about how great they look! Item arrived on time. Great experience. Bought two curtains, one for the closet and one for the modified bedroom door. We like them so much we are now looking at the painted curtains. Love it! Lots of compliments! Would/did recommend!! my daughter loves this curtain! i bought this for my daughter to cover her bedroom door, as we can't close the wood door, and she just loves it! she tells me almost every day how much she loves it! it was easy to install, and we received it sooner than promised! Wanted something to cover pantry opening, and look nice. These give nice coverage - not total blocking, of course, only doors would do that, but bamboo curtain blends well with the room, and doesn't tangle when you go in/out. Merchant Response:We're so glad you're enjoying your new curtain! Isn't it amazing how changing out 1 item can freshen up how a room looks and feels? You can enter 'beach' as a keyword search to see many more fun items to further your vision! The product came as described. I used it to replace a door that is in a tight spot. There wasn't sufficient room to open it fully. I wanted something there, but not a standard door. It doesn't block the view completely as a standard door would. I'd say it blocks about 50% of the view overall looking at it straight on, but in this case that doesn't matter. It looks nice I think. I can see why people use it as a wall decoration. I was able to cut the width with little effort to fit the door opening. I'm happy with the purchase and would buy it again. The curtain is attractive, but a little on the flimsy side as far as how it's put together. But I do have 6 and just ordered one more. Use them outside on patio to block the sun. Very good quality, looks great in the doorway. Thanks!! Loved it! Even friends enjoy it! Easy to hang with these hooks. Received my beaded curtain today and i love it! I ordered the curtain to put in an entry leading to the bedrooms. It fit perfectly in the door way and it gives my home a tropical look. good buy and worth the money! i also love the way the beads taper down to a smaller size at the ends. I have a laundry room just off the front door but the door couldn't close all the way because the washer is in the way. I'm glad I got the 90 strand it fill in the doorway perfectly and my cat can still get to her litter box. Fast delivery, product as-expected + prize! Product arrived 2 days after ordering w/ standard shipping. Product was exactly as-described and looks wonderful as a closet-door replacement in my home-office. There was also a cute rubber ducky included in the box... what a nice unexpected prize to add to my toy collection! ProsStrand "density" provides better coverage than others I'd seen in stores. I ordered this plain beaded curtain for our bathroom in a small apartment. Instead of having to keep the door closed the curtain gives enough privacy. We also have a cat litter box in the bathroom so our cat can go in and out easily, without our having to open and close door. 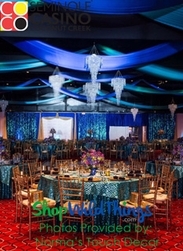 I ordered these shades for a 50th birthday party with a tropical paridise theme. They looked so good in my den, I still have them up--even in the middle of January! The shades are of high quality. I was pleased with my purchase.